Another great piece of automation is the terrific line of automatic pool cleaners. It is possible today to never have to hand vacuum your pool again. Our Pentair and Dolphin auto cleaners simply do the job for you fast and efficiently, ever thought of cleaning your pool while you sleep? Now you can just drop your auto cleaner in and head to bed for a great night’s sleep. In the morning your pool is clean and ready for that big event or just for you to jump in and relax. Take advantage of today’s technology and make your pool life easy. Recommended for pools up to 12 m (40 ft) in length. Cleans pool floor, walls and water line. 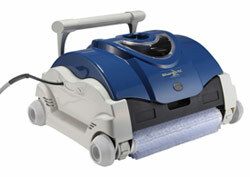 Maytronics is proud to introduce the new generation in robotic pool cleaners. The Dolphin Supreme M4 is a significant step up in robotic pool cleaner technology based on Maytronics’ many years of experience. Dolphin Supreme’s unique innovative features take all the hard work out of pool cleaning, while providing reliable cleaning results every time. Brushes, scrubs, vacuums, and filters the entire pool including the floor, walls and waterline. The new, advanced technology enables optimal scanning and pool coverage in a shorter cycle time. Add-on extra brushing system is twice as efficient. 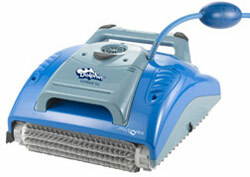 The rigorous brushing and scrubbing action reinforces the elimination of algae and bacteria. Patented pending top opening filtration compartements for easy and convenient maintenance. Patented pending Multi Filtration System (MFS): Ultra fine, Ultra fine disposable, and Spring cleaning. One-way water valves prevent the escape of debris and ensure rapid water drainage. Adjustable floats allow efficient scanning in different pool sizes. Low voltage motor provides minimal energy consumption. Automatic shut off at end of each cycle. DIY – easy maintenance, at user and local dealer level. Three year warranty (all parts included). Recommended for pools up to 10 m (36 ft) in length. Cleans pool floor and cove. Maytronics designed the Dolphin to provide you with hours of enjoyment in a clean, pure and hygienic pool. Recommended for all types of pools up to 50 ft. in length. Dolphin dx4 takes the hard work out of cleaning your pool. Dolphin dx4 is the robust, reliable and affordable member of the Dolphin dx family, renowned for its sturdy structure, wall climbing capacities and proven performance. 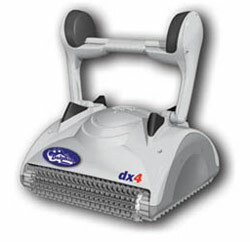 Dolphin dx4 will scrub, brush, sweep, vacuum and filter the entire pool in just 2.5 hours. Large filter surface ensures your pool stays crystal clear and helps reduce the need for cleaning chemicals. 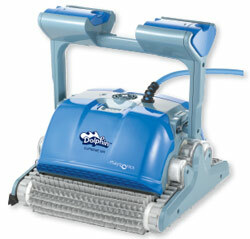 Dolphin dx4 is a dependable robot engineered to minimize the time spent cleaning the pool. An innovative cleaner with plenty of bite. Hayward’s SharkVac is the newest addition to the TigerShark® family of cleaners. SharkVac is built with proven TigerShark technology and the highest quality components. A sleek, low-profile design and top-access filter cartridges are a few of the great features that give the new SharkVac added bite. Scrubs, Vacuums & Microfilters; Without Hoses, Pool Filter, Booster Pumps or You! Complete Pool Cleaning And Savings At The Touch Of A Button! 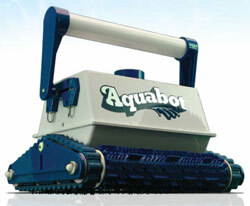 The computer-controlled Aquabot is pre-programmed by Aqua Products, Inc. to scrub, vacuum and filter dirt and debris from the floor, walls, waterlines and steps of all sizes, shapes and surface type of swimming pools in six hours or less — automatically.